Oil has been on everyone’s mind over the last month as the Middle East has continued to simmer. So how has this affected alternative energy stocks? Thus far the alternative energy sector has performed decently. 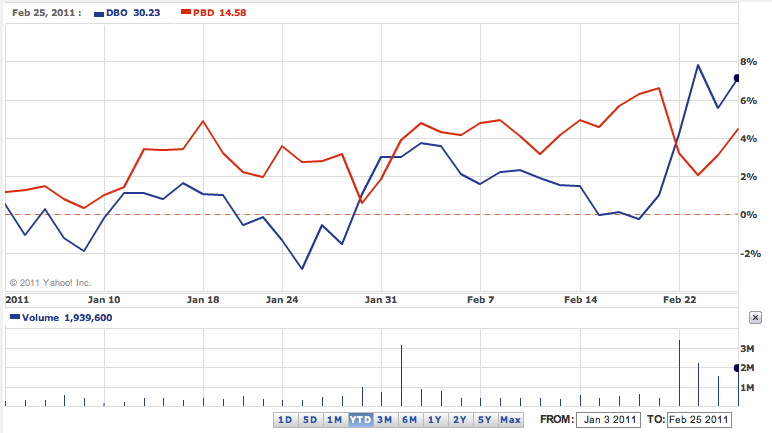 Take a look below at the chart of PBD, the global clean energy ETF, versus DBO, a futures based oil ETF. Broad based clean energy investing has made money this year but oil investments have been a better trade in 2011…except for one area of alt energy. Taking a closer look into the space reveals one startling bright spot: Solar energy. TAN, the largest Solar ETF, has distanced itself from the pack of alt energy technologies in the first two months of 2011. Its performance has been in the double digits, scorching single digit performing competitors including Nuclear (NLR), Coal (KOL) and Wind (FAN). Check out the year to date chart below. Quite simply Solar has crushed the other alternative energy options for investors and it has almost doubled the performance of DBO, the oil futures ETF. 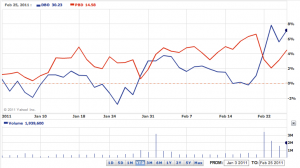 Will this market leadership continue for Solar? Certainly higher oil prices, increased Solar energy efficiency, lower technology costs and national security concerns regarding energy policy seem to be positive forces for the Solar market. In addition the embrace by corporate America and the U.S. government of larger scale solar projects is increasing. With all that being said, this outperformance is still noteworthy. 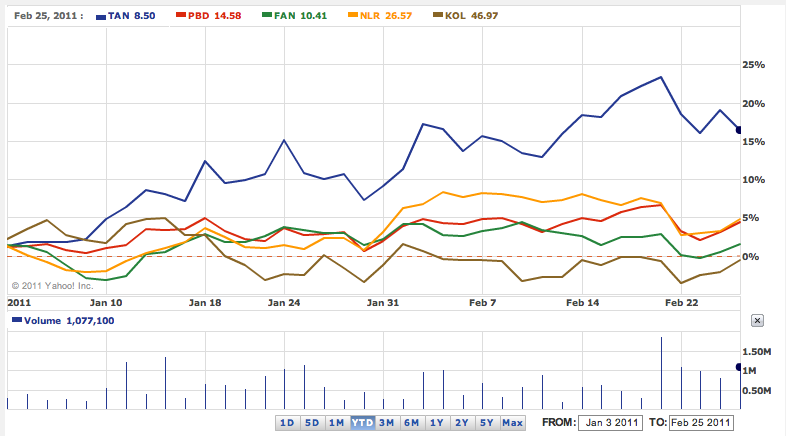 We’ll revisit TAN, PBD, KOL, NLR and FAN to find out if this curious outperformance lasts.